This 2CD set presents a selection of the most famous, best‐loved organ works by Johann Sebastian Bach, ranging from intimate chorale preludes, ingenious fugues, and a sparkling Concerto transcription to the monumental Toccata and Fugue in D minor and the towering Passacaglia in C minor. There is no piece of music as synonymous with the organ as JS Bach�s Toccata and Fugue in D minor, BWV565: the two‐note introductory motif is as well recognised as the opening of Beethoven�s Fifth Symphony, and has featured widely in popular culture � in films such as Disney�s Fantasia and The Phantom of the Opera. Interestingly, it may actually be an arrangement for organ of an original work for violin, possibly not even by Bach himself! 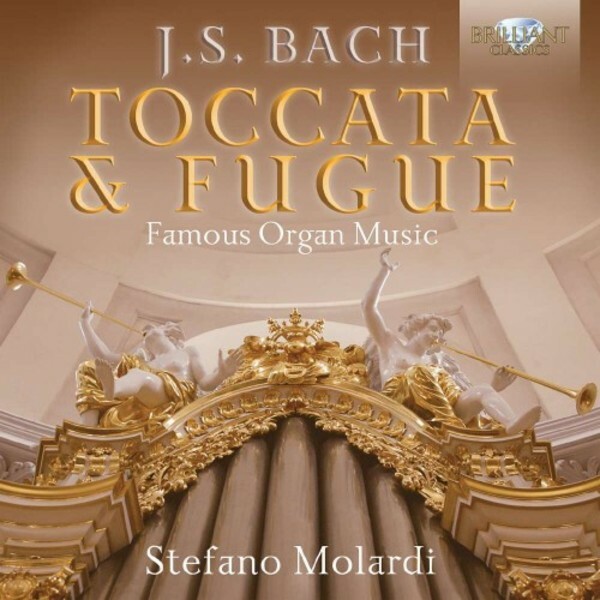 However, regardless of its authenticity, it is this fantastical and much-loved piece that opens Stefano Molardi�s recital of Bach�s greatest compositions for the �king of instruments�. Molardi�s programme continues with major works such as the Toccata, Adagio and Fugue in C, BWV564, and the monumental Passacaglia in C minor, BWV582, interspersed with more delicate pieces from the composer�s different collections of chorale preludes � the Orgelb�chlein, �Sch�bler� Chorales and third part of the Clavier�bung. The Trio Sonata in C, BWV529, adds some great variety to the compilation, and is a feat of technical ingenuity, with three individual melodies taken up by each hand and the feet of the player. This two-disc set brings together the best‐known organ works by its greatest patron: a perfect introduction to organ music for a beginner, and a marvellous addition to the collection of an enthusiast already well-versed in the repertoire. Award‐winning organist, harpsichordist, conductor and scholar Stefano Molardi is a peerless interpreter, who has recorded Bach�s Complete Organ Music for Brilliant Classics (95105BR). The instruments heard on this album date from Bach�s time, therefore bringing us as close as possible to the soundworld of the great Leipzig Cantor and allowing us to hear them as he might have done himself. Recorded in 2013 on four historic instruments.